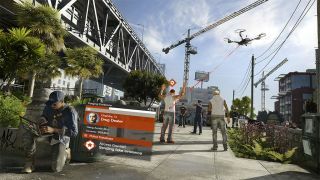 Ubisoft is getting ready to release Watch Dogs 2 in a couple of weeks, though rather than place a pre-order (if you were planning to), you can score a digital download with the purchase of certain model Samsung SSDs and curved gaming monitors. Note that the offer does not include Samsung's 950 Pro line. It also excludes lower capacity options on several of the drive lines, such 256GB and 128GB SSDs in the 850 Pro family. Otherwise, it's a fairly robust list of fast storage options. Purchases also have to be made from an authorized dealer. The list is pretty extensive and includes the likes of Amazon, Best Buy, Newegg, and many others. It's also only open to U.S. residents. Go here for fine print details and instructions on redeeming your game code.